An excerpt from “The New Evangelization and the Year of Faith: The Challenges of the Contemporary Church”, a talk by Cardinal Thomas Collins, Archbishop of Toronto. Given at Toronto’s Theology on Tap, hosted by Faith Connections, May 27, 2013. Faith Connections invites young adults (19-39) to join us for an evening of thought-provoking theological discussion in a comfortable and relaxed setting, with special guest: Michelle Henry, corporate lawyer. Do we have to compromise our faith in order to be successful in the corporate world? Munchies provided, cash bar, come and bring a friend! For more information call Vanessa Nicholas-Schmidt at 416-467-2645 or visit www.faithconnections.ca — a ministry of Fontbonne Ministries, Sisters of St. Joseph, Toronto. Faith Connections invites young adults (19-39) to join us for an evening of thought-provoking theological discussion in a comfortable and relaxed setting, with special guest: Paul Robson, SJ, theology student at Regis College. He will share what he learned through his friendships with Bhutanese refugees. Munchies provided, cash bar, come and bring a friend! For more information call Vanessa Nicholas-Schmidt at 416-467-2645 or visit www.faithconnections.ca — a ministry of Fontbonne Ministries, Sisters of St. Joseph, Toronto. Faith Connections invites young adults (19-39) to join us for an evening of thought-provoking theological discussion in a comfortable and relaxed setting, with special guest from Ireland: John Pridmore, author and speaker. He will discuss how he went from a life of darkness as a London gangster to working with people like Mother Teresa and speaking at World Youth Day. Munchies provided, cash bar, come and bring a friend! For more information call Vanessa Nicholas-Schmidt at416-467-2645 or visit www.faithconnections.ca — a ministry of Fontbonne Ministries, Sisters of St. Joseph, Toronto. All young adults (18-39, student, working professional, single, married, young parent) are invited to our house party and barbecue! 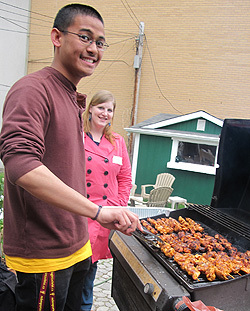 Faith Connections, St. Patrick’s Parish, and the Religious communities of Toronto invite you to a barbecue supper. Come and hang out with other young adults. Meet with men and women religious and explore how their spiritualities can nourish your faith journey. Last year’s event was a great success — don’t miss it this year! Click here for a printable poster.